I Love My Amazing Animals: Have a great weekend! Same kitty, Lucy Blue! 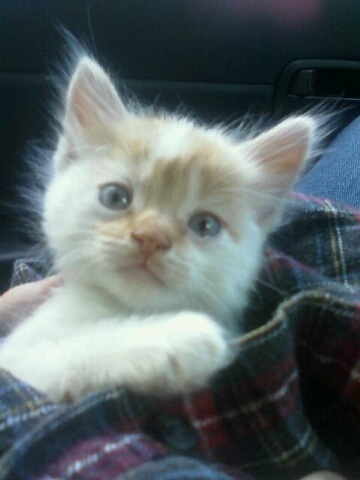 This is my daughter's friends kitten! The one who just had the bath yesterday! She is just having a better hair day today! I hope you all enjoy your weekend and don't forget to hug your pets! I like the little wisps of fuzzy hair sticking out above her head. Too cute! Awww Lucy Blue!!!! Don't you just look so fluffed up and adorable??? Awwww - me and Charlie did feel a little sorry for you yesterday!! But we are glad that you are now dried and floofed up! Take care and have a lovely weekend too Deborah and all Amazing Animal Lover's Blog! See, Lucy Blue - we just knew you would look gorgeous. You are such a pretty kitty -love those eyes. Aw!!! She's full of static electricity. That poor kitty needs some creme rinse and conditioner after her bath!! But somehow I don't think she'd have liked that very much. Hope you have a great weekend! She looks extra tasty and khute all fluffed up! Aw, Lucy Blue is gorgeous=lovely furs with such a sweet, precious face and stunning eyes!...That kitten face makes me smile!...Have a fun day, Deborah! awwwwwwwwwwwwww, Lucy Blue is just too cute! She looks like she'd be so soft to the touch. Little Lucy Blue has beautiful blue eyes. Oh my...cute doesn't even come close to describing that cute little ball of fur!!! Aww, Lucy Blue. You're SO CUTE! She looks much happier today! we hope your weekend was a good one! What a cute kitty - that face speaks volumes! It's been a long time since I had a kitten - kittens are so much fun! Have a great day and stay cool and hug your pets! We have cats and rabbits.